Welcome to Antiques & Moore! 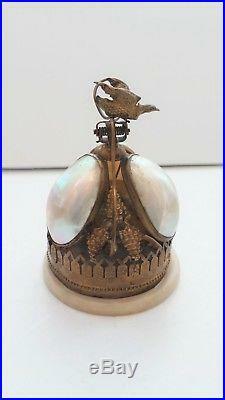 This listing is for a 19th Century Palais Royal novelty table service bell decorated with Mother of Pearl shells and ormolu. These bells were used to call servants or to signal the service of the next dinner course in homes of the wealthy during the Victorian era. 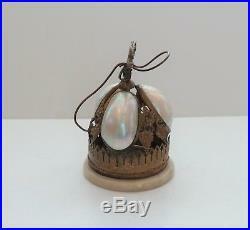 The bell itself is surrounded with three egg shaped Mother of Pearl half shells separated with three bunches of grapes. This decorative cover is mounted with a spring mechanism at the top that when pressed from the back raises the bell striker which when released rings the bell with a loud, clear tone. Perched on the top of the spring mechanism is a stamped brass bird in flight. The circular base is made of white alabaster with an engraved, pierced crown-like wide decorative band above. Measures 5 1/2" high with the base being 3 5/8" in diameter. This lovely table bell is in very good Estate condition although it does reflect normal signs of wear associated with age and a couple of flaws as follows. One of the Mother-of-Pearl shells has a couple of very tiny holes on one side, however, they are natural flaws in the shell and not damage and one of the grape clusters has a tiny break on one stem which we have not tried to repair. The most prominent flaw is to the bird at the top of the bell which was probably double sided, however, is currently one sided with slightly bent wings and is missing the end of its tail. Since the bird is facing the front of the bell, it still has a good appearance when displayed. Have been in the Antiques business for over 30 years and try to describe our items as accurately as possible. We are happy to answer any questions and always appreciate your business! The item "PALAIS ROYAL Mother of Pearl Ormolu Table Servant Bell (#1)" is in sale since Wednesday, March 7, 2018. This item is in the category "Antiques\Decorative Arts\Other Antique Decorative Arts". The seller is "antiquesandmooresales" and is located in Hendersonville, North Carolina. This item can be shipped worldwide.